Looks like Pulpit Chimney to me, or something near by. >Looks like Pulpit Chimney to me, or something near by. >>Looks like Pulpit Chimney to me, or something near by. I think this year will be the fortieth anniversary of my first time up it! Sorry! You have a go too - I give papal dispensation (he said without any authority whatsoever). 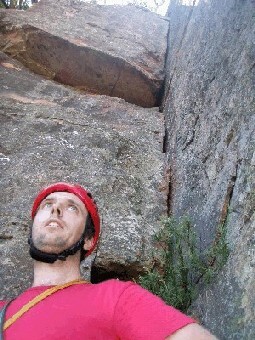 I think I have probably climbed that route more times than any other in Australia. I never really get sick of it. Something a bit different. Just name the formation they've just climbed. Yup, winter climbers on the hump. >I never really get sick of it. I don't rate the first pitch nearly as highly as the second. The shenanigans in the wide bit always freak me out. >>I never really get sick of it. >in the wide bit always freak me out. The wide bit is easy, and from the posts above I now know the sicko* responsible for polishing the holds in the under-roof traverse! Bah! Easy? One man's easy is another man's awkward. >Bah! Easy? One man's easy is another man's awkward. Might be less awkward if you give up that weird retaining the onsight style? I can see simey is going to be busy when he gets back, sorting you lot out! ~> It went too quick. Should have cropped it more to make it harder! (credit to jkane & p.watling for the photo).